We recently had to share the news of the passing of Alan Young, the voice of Jack Allen, and now we must share the news of the death of another actor from classic Adventures in Odyssey. Janet Waldo passed away on June 12, 2016 from an inoperable brain tumor at the age of 96. She had been a member of the Odyssey cast since 1992. 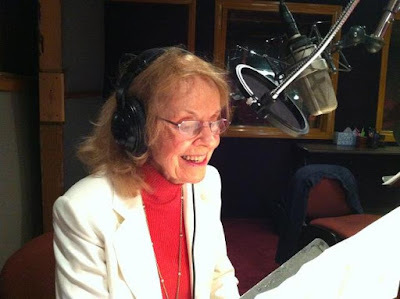 Waldo recording lines for her last AIO appearance in 2012. Janet was originally brought to the series to play Maureen Hodges, the mother of fan favorite kid character, Lawrence Hodges. A year after the character of Maureen was last heard from, Waldo appears in episode 367 "The Decision" in the role of Joanne in 1996, which she played until 2012 with her last appearance in episode 725, "Home Again, Part 2". Janet Waldo played Corliss Archer on radio for nearly a decade. 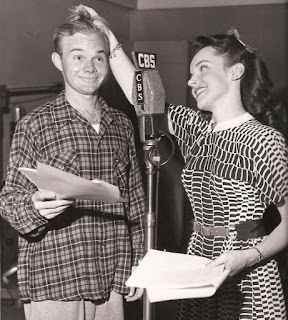 She is pictured here with Sam Edwards who played the role of her neighbor, Dexter Franklin. Janet was also a distant cousin of poet, Ralph Waldo Emerson. She was married to playwright, Robert Edwin Lee from 1948 until his death in 1994.